I love books - all kinds of books, a far-flung variety of books on many diverse subjects: local history, local flora and lore; the Renaissance, rain, Romeo, reliquaries; madness, mind control, men-about-town; penguins, parasols, Peking, pottery; nature, nurture, nightingales, nordic myths; woodworking, Wisconsin, wigwams, winter; shells, stars, sermons, summaries, situations. And most everything in between. For a bibliophile, browsing for books is a special joy. 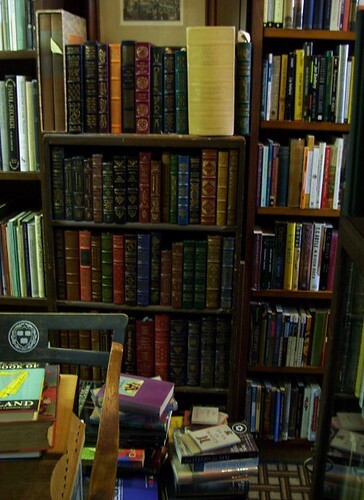 The experience is rarefied when you find an independent bookseller whose shop offers an eclectic variety of books on many subjects. 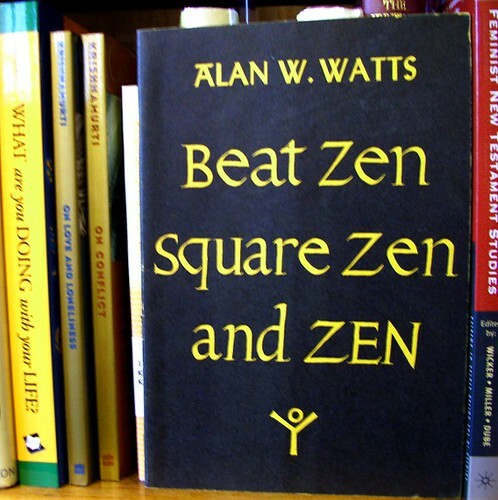 In Santa Barbara, Lost Horizon is a book-lover's bookstore. 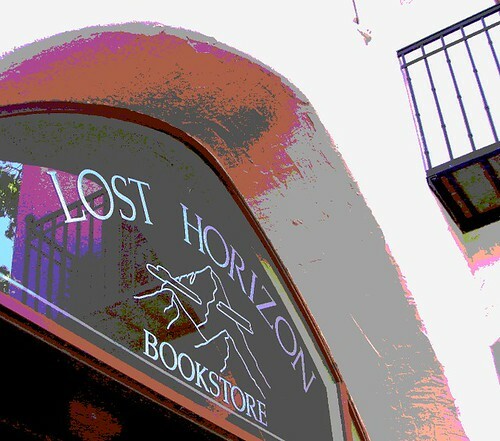 Located at 703 Anacapa Street, just one block east of State Street, Lost Horizon Bookstore has made its home in a cozy little shop in the large, pink stucco building, since 1983. An ever-changing display of colorful and interesting books are exhibited in the windows to pique your interest and to entice readers to enter the shop. 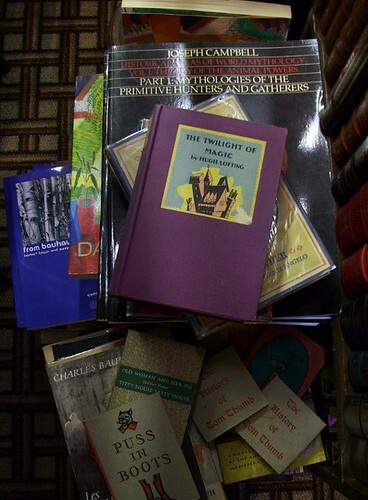 Most of the books offered for sale at Lost Horizon are vintage, rare, out-of-print, first edition, or antique. 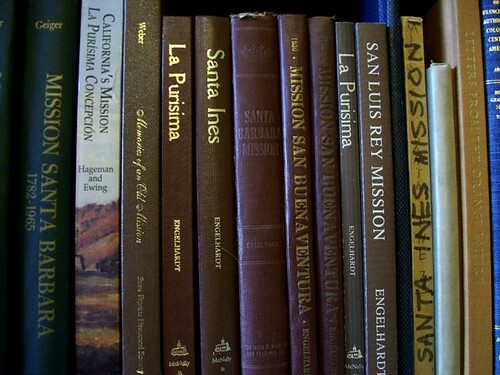 The owner of Lost Horizon, Jerry Jacobs, is a member of the Southern California Antiquarian Booksellers' Association of America. Mr. Jacobs has accumulated an amazing variety of books, giving special favor to books about fine art, folk art, and decorative arts, antiques, photography, and architecture. 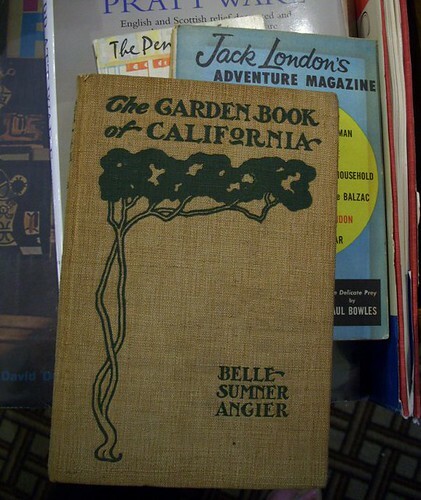 He also features a great selection of historical books and pamphlets of local interest. 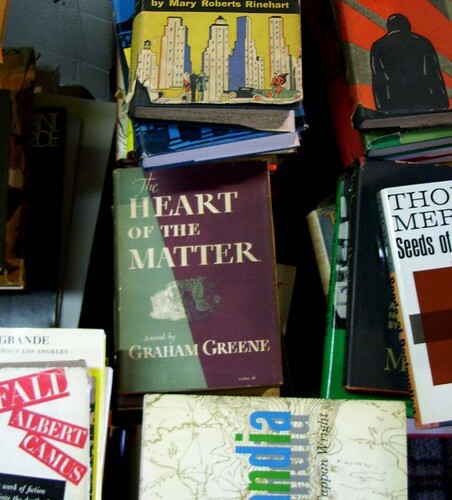 On every shelf and surface, you will find books - in colorful stacks and small towers - books are situated all through the shop. And the proprietor, Mr. Jacobs, understands those who love books: "Let me know if I can help you with anything", he always offers. Then, he leaves you alone, to wander, to reflect, peruse, prowl and ponder his incredible inventory. You will have free reign in the shop, for hours, if you like. It is easy to lose time, to get lost in this small and intimate shop. Mr. Jacobs is a host most genial. He will converse pleasantly and with great warmth. He offers an appraisal service, recommends reads, will search diligently for that rare tome you seek. Most importantly, he shares in your love of books. 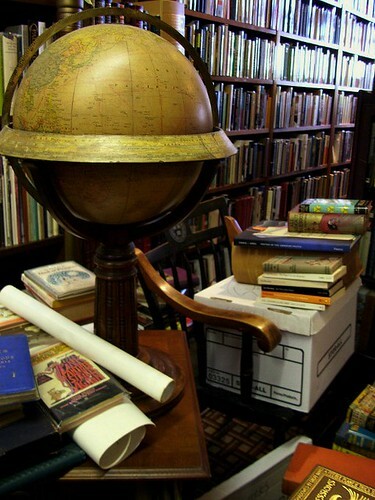 Additionally, Lost Horizon has a great selection of vintage maps and posters, art photography, beautiful color plates and chromolithographs from old books, and other rare, interesting ephemera. 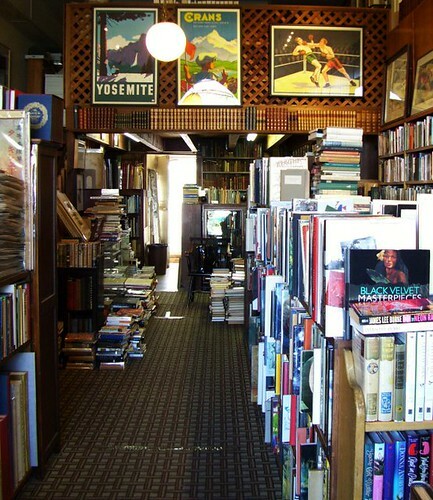 Of course, Santa Barbara has the same, big, chain bookstores that you surely have in your own city. You can purchase current magazines, find Oprah's favorite authors, and selections for many book clubs; you'll locate books by Judith Krantz, Sylvia Browne, and James Patterson, along with self-help, diet, exercise, and travel books, Chicken-Soup-for-Anything books, romance novels, and "Recommended Summer Reads...."
But if you are looking for something different, something - more - you must stop by Lost Horizon Bookstore. And after you've purchased your selections and you want nothing more than to find an excellent cup of coffee and a small bistro table, a relaxed place to sit and read for just awhile, Pacific Crepes is right next door - one of the best, most authentic, and friendliest French restaurants between LA and San Francisco. 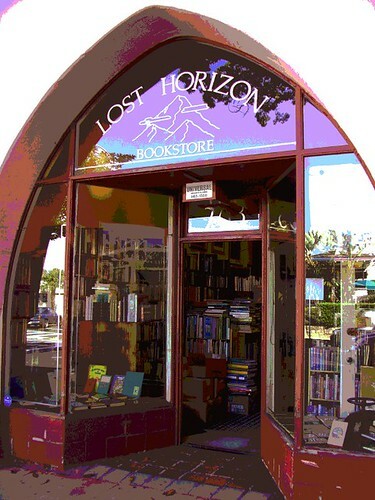 If you don't live in the area and you are not able to visit Lost Horizon in person, visit Lost Horizon online at Abe Books. If you have any questions about the store, or would like information about a hard-to-find book, give Mr. Jacobs a call at: 805 962 4606. Jerry is indeed a most knowledgeable and trusted bookseller in SB. I would head across the street to The Paradise Cafe instead of Pacific Crepes, though. The Paradise is almost as esteemed an institution as Lost Horizon Books - the Paradise Burger is not to be missed.